Freddy Camacho is the owner of CrossFit One World. He has been a staple of the CrossFit community for a few years now. He is one of the trainers who travel with the CrossFit Level 1 seminars. 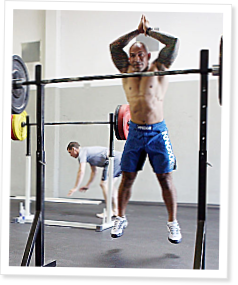 He was a participant in both CrossFit Games (while in his 40s), finishing 13th in 2007 and 24th in 2008. This is the second of a series (The Best of CrossFit.com) in which dedicated and/or long term CrossFitters highlight their favorite or most influential archives from the vault. Freddy takes us back to 2003, the first year of the current (2003-2009) website. There were several firsts, actually. The first post (Robb Wolf), the first Fran, the first named workout. This trip back helps us appreciate how far we have all come. Please feel welcome to post your favorites in comments, or if you have a compelling list, submit them as independent articles. That was a cool article. Thanks! Right on! I'm looking forward to meeting you at the Level 1 Cert in Okinawa (Japan) next month. What a hoot that the first comment on the proto-"Fran" was by Coach Rut, asking why it was 21 reps instead of 20, or 9 instead of 8! Go Rutman! "It may have been three months since seeing this exact variant but the interconnectedness of the functional morass that we call CrossFit is tighter knit and more broadly applicable than we realize." He was commenting on the fact that someone increased their Helen time by a minute in three months. It's cool to think how much they were learning and to think about the point they all realized that the concept of crossfit is awesome! I wonder when Coach realized how big it would become? this part had me laughing. - "WTF? No “pseudo gang signs” being flashed and everyone had their shirt on"
Great article Freddy. It's always good to reflect on the imputs of the program to make sense of the outputs. Which leads me to wonder,since I've finally started CrossFitting in earnest, where will MY performance be in two or three years?